As we approach the close of another year, we look back on these remarkable twelve months with thanksgiving. We thank Our Lord for your prayers, your encouragement and your financial help. It’s because of you that we are able to beam 24 hours a day throughout this vast region, broadcasting the Mass and Rosary, and bringing information, education, news and positive companionship into thousands of homes located in extremely remote villages. We tip our hats to you, and we remember you and your intentions in our daily prayers. Thank you! “SNOW” TIME LIKE THE PRESENT: (left) As snow flies past at 35 MPH, KNOM volunteer music director Anna Dummer pauses for a moment on the back steps before heading to the Nome post office. The photo was taken at 11 AM in mid-November. 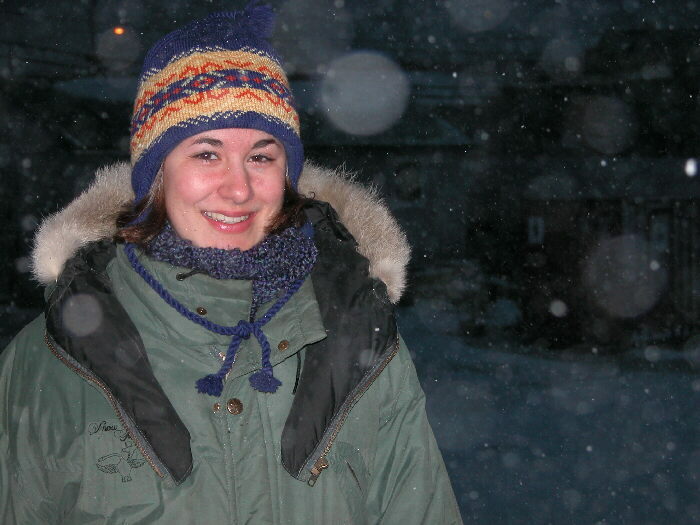 From Lansing, MI, Anna came to Nome in June. You’ll hear her bright, cheerful voice weekday afternoons. RECENTLY SPOTTED: During 2003, KNOM has broadcast about 34,000 inspirational spots and 34,000 educational ones, too. The average listener hears about 9,900 spots each year. Founded in 1971, KNOM is owned by the Catholic Diocese of Fairbanks. 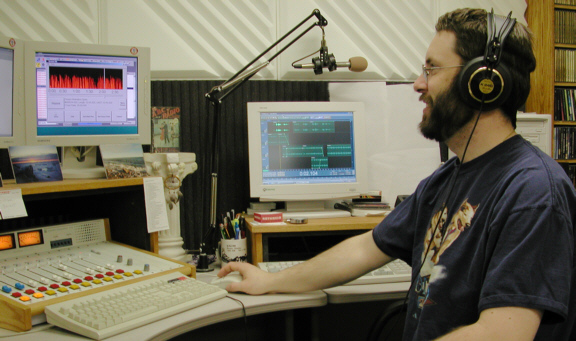 The oldest Catholic radio station in the United States, it is a trusted friend throughout 100,000 square miles of western Alaska. It’s an area without highways and without many of the comforts we normally associate with life in the U. S.
Its people suffer poverty and rates of suicide, alcoholism, domestic violence and sexual abuse at rates that are many times higher than those in the Lower 48. By supporting our mission, you are offering these isolated families an encouraging hand. INSPIRATIONAL SPOT: The shortest distance between a problem and a solution is the distance between my knees and the floor. INSPIRATIONAL SPOT: Teach me, my God and King, to see You in all things, and to see You in all that I do. 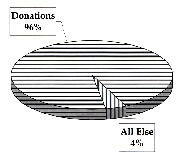 EXPENSES: Total operating expenses for our mission were $978,594 for the fiscal year which ended on June 30, 2003. (Left) The thumbnail is hard to read, but as you can see from the full size image, the cost of maintaining our permanent and volunteer staff members was less than half this cost. 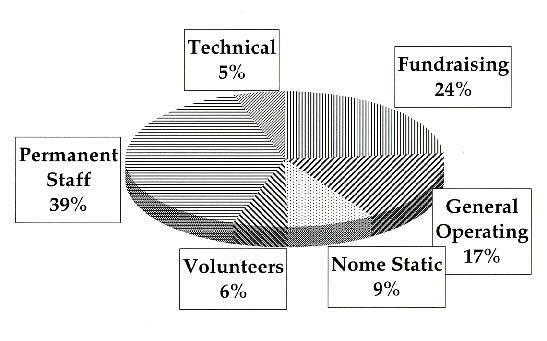 The volunteers’ contribution is especially apparent. Fundraising includes all expenses involved in meeting the need to replace approximately 15% of our contributors each year. It was exceptionally high for us this past year, as we were still recovering from a steep drop in new contributions following the events of September 11, 2001. For the next year, we anticipate that this expense will drop below 20%. 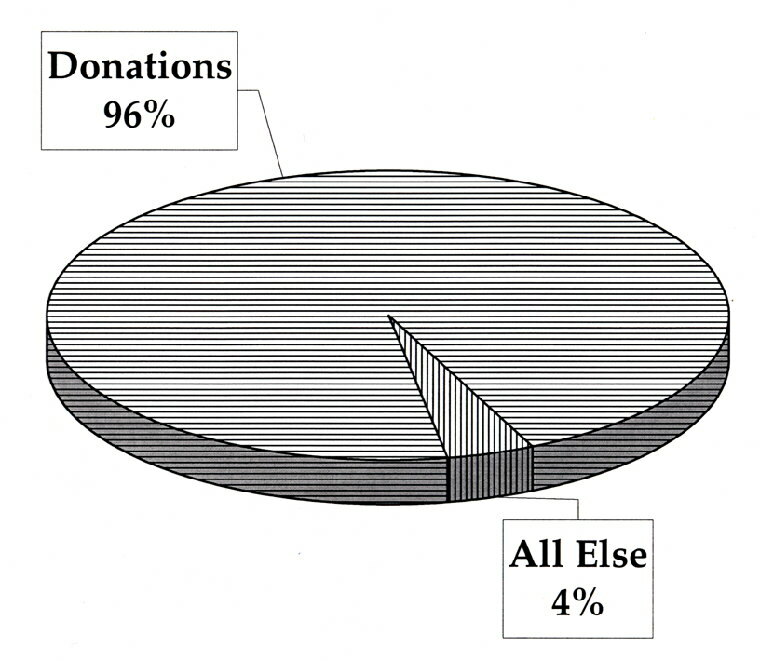 INCOME: (Left) 96% of our operating income is from individual contributions from people like you. Other sources include underwriting of programs from local businesses, grants and interest on emergency savings. Our mission carefully adheres to the Precepts of Stewardship established by the National Catholic Development Conference, of which KNOM is a member. If you have any questions, or would like to receive our complete balance sheet, please write general manager Tom Busch, and he will be happy to reply. If you wish, you can e-mail him at tbusch@knom.org. CHALLENGED: This has been a year of unprecedented awards for our mission and its staff. In the mission’s history, however, it will be remembered as the year in which we applied for translators (booster transmitters) in distant villages. We applied for them in response to a rare opportunity afforded by the Federal Communications Commission, which prior to March, had not accepted such applications for years. Our present estimate is that each of these translators will cost up to $5,000 to construct. They will be fed our signal by satellite. We have not received a firm estimate for the cost for that service, which we expect will cost some $30,000 to $40,000 a year. Further, we will need to maintain the equipment. Thus, we have created quite a challenge for ourselves. We will keep you in touch as the project approaches. WILLFULLY: Please consider adding missions like KNOM to your will. We prayerfully place all bequests into funds that are used only for major improvements, or to help the mission survive future emergencies. INSPIRATIONAL SPOT: Between the great things we cannot do and the small things we will not do, the danger is that we will do nothing. Mike’s 46 “Eskimo Stories” have won many other honors during his four years at KNOM. In June, Mike leaves the mission to further his education in Seattle. 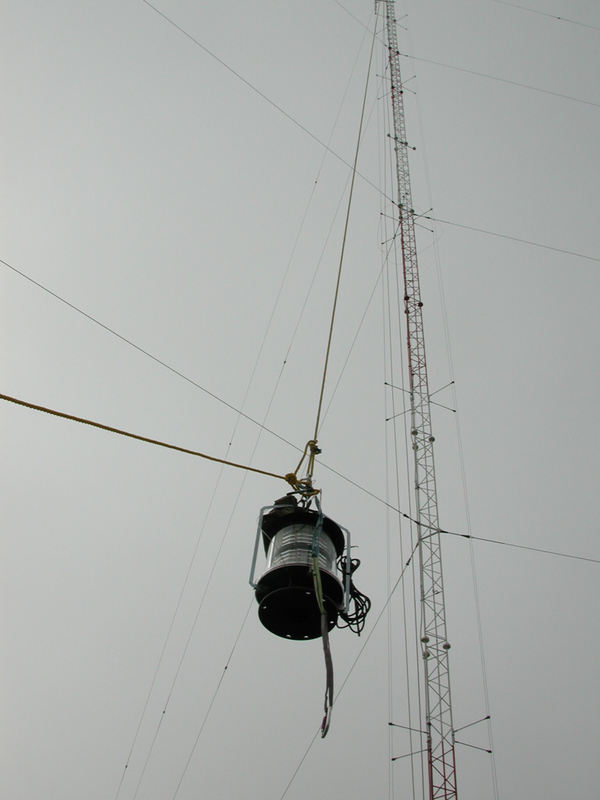 March 17th: KNOM files initial applications with the Federal Communications Commission, to construct “translator” repeater stations, to re-transmit our signal in 13 remote villages. Some of the distant villages currently receive KNOM poorly, some have no radio service at all. (Left) You can see that the proposed little transmitters will be located in some mighty out-of-the-way places! 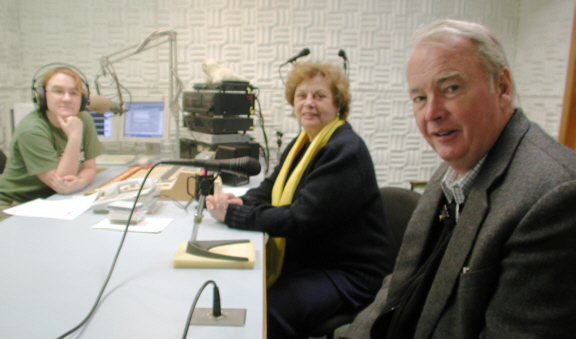 In March (left), KNOM volunteer Julia Dunlap interviews Alaska governor Frank Murkowski and his wife Nancy in Studio C.
March 20th is the first day of spring. Nome sees a high temperature of +10° and a low of -10°, which, according to the National Weather Service, is exactly 10° below normal. In April, the National Association of Broadcasters honors KNOM and nine other stations with its Crystal Award for Excellence. It’s KNOM’s third Crystal. 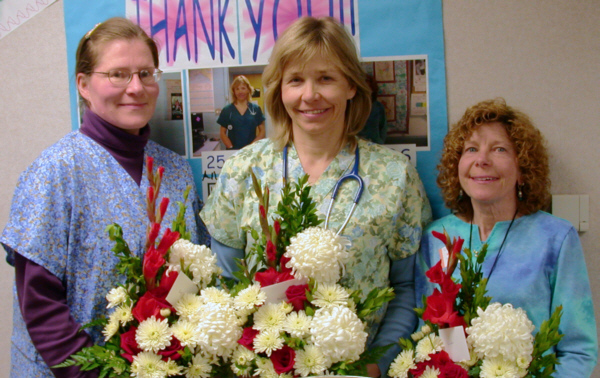 (Left) In May, Nome’s Norton Sound Regional Hospital honors three nurses, each of whom has served the hospital for over twenty years. (From left) Terry Romenesko, Annie Blandford and Linda Peters all came to Nome as KNOM volunteers. They’re among 71 nurses and four doctors who once kept the mission alive, living as volunteers, contributing their entire salaries. In June, a three-man tower crew spends six days repairing and performing preventive maintenance on the station’s 34-year-old tower. They replace the tower’s incandescent lights with a new, extremely efficient Light Emitting Diode assembly. This greatly reduces electric consumption. Combined with reduced tower climbing for bulb replacement, the move is expected to save the mission some $30,000 over ten years. 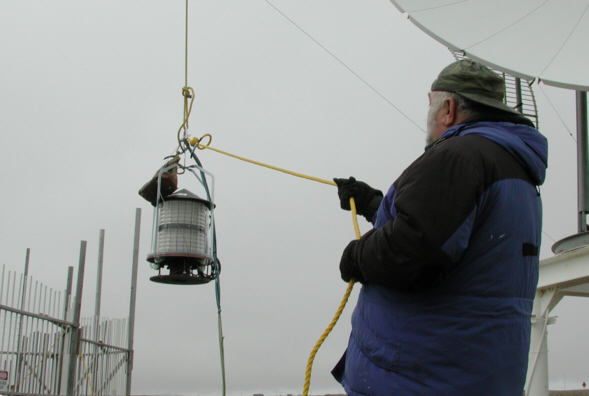 (Left) KNOM engineer Les Brown belays the new beacon as it is hoisted upward. 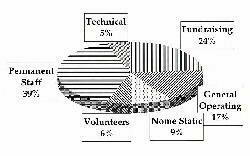 The June Nome Static includes an unusual image, a grocery receipt. Buying salad vegetables for a going away party for Mike Nurse, KNOMers are horrified to discover that a single medium-sized head of cauliflower costs $8.97. It’s a stark illustration of the sky-high cost of living in Nome. Due to the lack of roads, all perishable items must be shipped into town by air. That month, KNOM quickly passes an “alternative” FCC inspection by licensed inspector Ken Benner, who pronounces the station in full compliance with all rules and regulations. June and July: All three of KNOM’s 2002-3 volunteers, Emily Barrett, Amy Flaherty and Julia Dunlap have signed up for a second year of service. They are joined by Anna Dummer and Clinton White, who quickly come up to speed. August 29: Final application is made to the FCC for eleven of the translator stations. (The Commission has accidentally deleted two of the villages, Chefornak and Nightmute from their list, and these villages will be added later.) 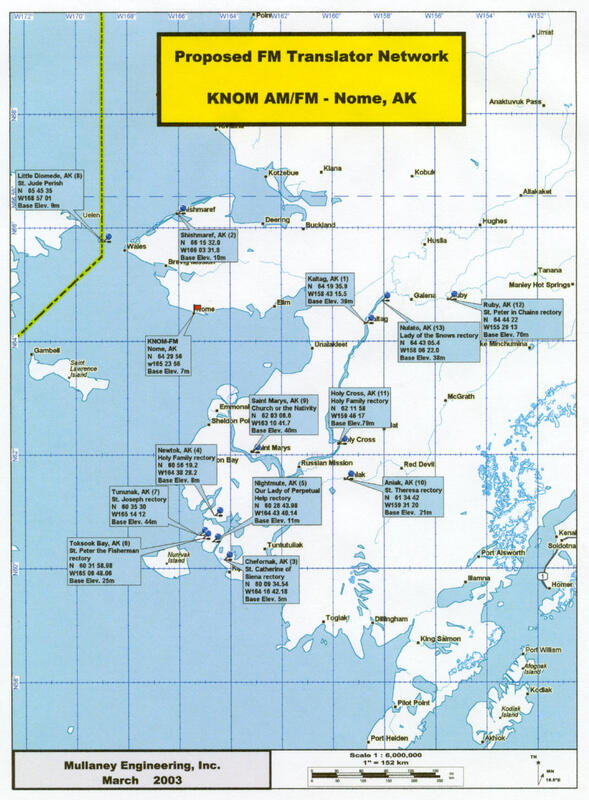 Approval is expected some time in 2004 for KNOM to install these 10-watt transmitters, to beam our signal into the villages of Little Diomede, Shishmaref, Kaltag, Nulato, Ruby, Holy Cross, Aniak, Tununak, Toksook Bay, St. Marys, and Newtok. October 2: In Philadelphia, the National Association of Broadcasters presents KNOM its Marconi “Religious Station of the Year” Award. It’s KNOM’s second Marconi. 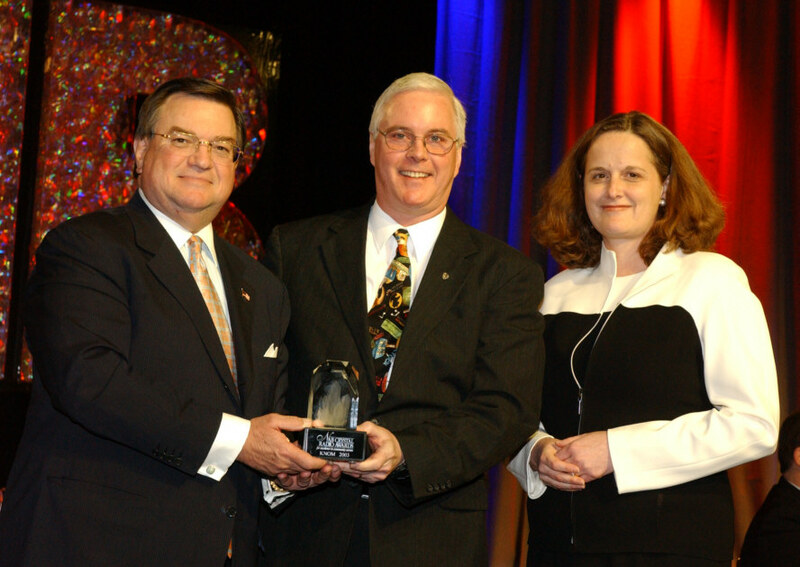 October 18: KNOM receives the Gabriel Radio Station of the Year Award in St. Louis. It’s the station’s 11th such Gabriel, and the eighth in a row. KNOM is the only religious station and the only small station to ever receive this honor. 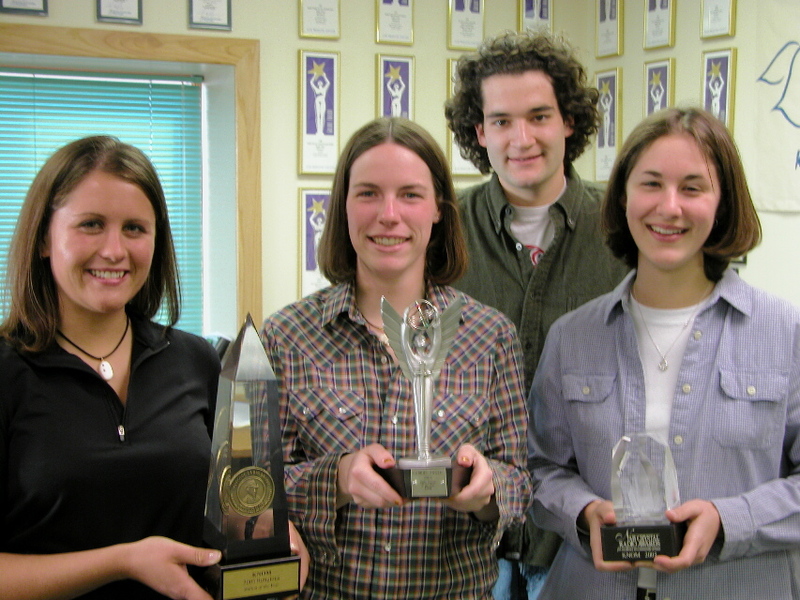 (Left) From left, volunteers Amy Flaherty, Emily Barrett and Anna Dummer hold the 2003 "triple crown," KNOM's Marconi, Gabriel and Crystal Awards, as volunteer Clinton White joins in. 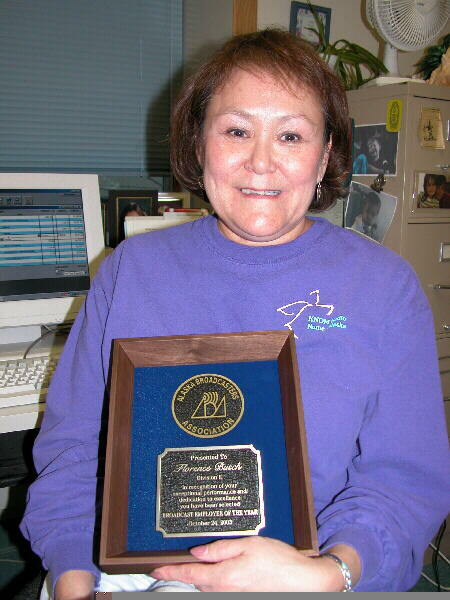 October 24: In Anchorage, KNOM is presented with five Alaska Broadcasters Association Goldie Awards, including the prestigious Best Service to the Community, and Best Radio Web Site. (Left) KNOM business manager Florence Busch, coerced into attending her first ABA awards ceremony in twenty-one years, is shocked to find herself the Alaska Broadcast Employee of the Year. Before her name was announced, as the honoree's hardworking traits are being praised, Florence leans to the woman next to her and quips "this person needs a life." A moment later, she receives a standing ovation from the crowd of 250 fellow broadcasters. Late November: Western Alaska is hammered by a series of powerful storms. The ocean level at Nome rises alarmingly, though not quite to flood stage. Big news on KNOM is that 130 miles to the north, the village of Shishmaref, a remote point set to receive a KNOM repeater station, loses 30 feet of precious land to the hammering surf. Thank you again! Your financial support and your prayers are our mission’s greatest strength. We pray that you and those you love enjoy many blessings in the coming year. May God be with you. Happy New Year!